A well-equipped transport combined with an equally well-made DAC that has a powerful, but slightly dark sound. Stello is part of Korean company April Music's roster and we've seen a variant of the DA100 DAC before when Russ Andrews modiﬁed it and sold it as the DA-1 alongside a matching pre/headphone amp and power amp. 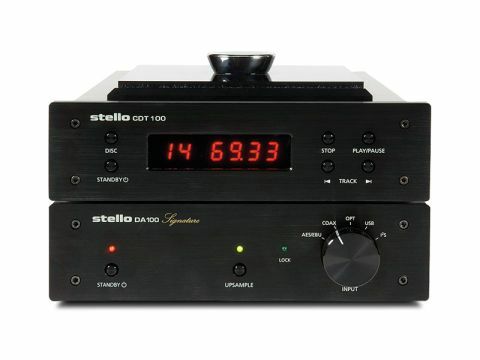 The solid, half-size brick construction remains with this pairing, the Stello CDT100 CD Player and DA100 DAC, which by virtue of its two-box nature has a varied array of socketry. The CDT100 must be the most affordable top-loading transport in the game; it's well-built, with a shiny magnetic clamp and acrylic cover that doesn't need to be in place in use. What differentiates it is the provision of an I 2S digital output on a mini DIN socket. This allows the transport to send a separate clock-sync signal to suitably equipped DACs alongside the digital bitstream. In the days before re-clocking DACs, this was a good system for reducing jitter, but it's very rare nowadays. The CDT100 can't tell when you've put a new disc on so you have to inspire it to read the thing by pressing 'disc' before it will play. The DA100 Signature convertor naturally has an appropriate input for I 2S and accommodates all the more popular digital interfaces as well. It can't tell you what the incoming bit rate is but it can upsample to 96kHz or 192kHz, and it will accept up to 96kHz on all but its USB input, which is restricted to 48kHz. By a small margin, the best measurements were taken with no 'upsampling' on the DA 100. Jitter became a factor with the upsampling engaged at 1363.5ps at 24-bit/96kHz and 1683.5ps at 24/192. Distortion also rose to 0.08 per cent with the unit in it's 24/192 setting and the dynamic range fell by 0.3dB. These figures don't look or, perhaps, amount to much, but you would be forgiven to expect them to go up. We measured a +14dBr gain above standard line level from the DAC when injecting a 0dBFS test tone from the generator and receiving +14dBr on the balanced analogue outputs; +7.6dBr unbalanced. This could potentially generate when connected to a sensitive power amplifier stage. The CDT100 delivered textbook results for a CD transporter when measuring it's digital output. Test tones and sweeps all tracked perfectly. One unusual ﬁnding was that the upsampled output was notably darker than the standard result, such changes don't usually elicit an obvious tonal change. Overall, the panel preferred the non o/s result, which has some vivacity to it. In all instances we used the supplied mini-DIN I 2S cable as digital interconnect for listening. This pairing got a mixed reception from the blind-listening panel; one thought it rather timid and reserved with slight sibiliance in the high frequencies, whereas another enjoyed the quality of image, strength of ambiance and timing on Walk on the Wild Side. Our third listener was less impressed noting a "lack of perception of the instruments" with a La Folia piece and a lack of 'air' in the highs of a Sarah McLachlan track. Further listening did not greatly enhance these impressions; there is a lack of transparency to the midrange and in timing terms, it likes to take its time; this works with some material but can seem a bit lugubrious with more sedate pieces. It's a pity because the build quality is excellent and you get a lot for your money. We suspect that the DAC, at least, is beginning to show its age and might not be helping matters. The Stello transport, however, is something of a rare ﬁnd.